Aquarium Salt has been used for years to help treat illness and reduce transportation stress when for sick or new fish moving into their new tank homes. Made from all natural evaporated sea salt, aquarium sea salt improves the health of your tropical fish by reducing stress and improving gill function. Aquarium Salt has been used for years to help treat illness and reduce transportation stress when for sick or new fish moving into their new tank homes. Made from all natural evaporated sea salt, aquarium salt has long been a staple for tropical fish hobbyist around the world. Using aquarium sea salt improves the health of your tropical fish by reducing stress and improving gill function. Super easy to use, in most cases, all you need is one rounded tablespoon full of aquarium salt added to your tank to begin the healing process and the reduction of stress. If you are introducing new fish to your tank, the travel and packaging process can be extremely stressful to your fish. The soothing all natural sea salt introduces electrolytes your fish needs to increase oxygen intake and release ammonia from its body. 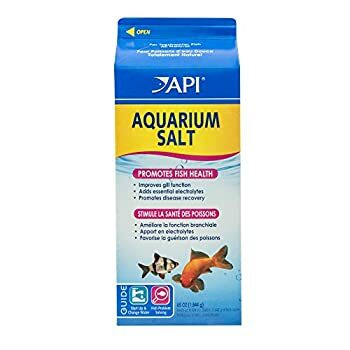 When treating a sick fish in a quarantine tank, aquarium salt can be used in combination with medicine to help reduce stress, sooth the gills and increase breathing and intake of oxygen. By far one of the most commonly used and easily administered products to help keep your fish healthy. Just one tablespoon can help your fish breath easier, reduce stress and improve overall health and vitality. Every tropical fish hobbyist should have aquarium salt in their home.